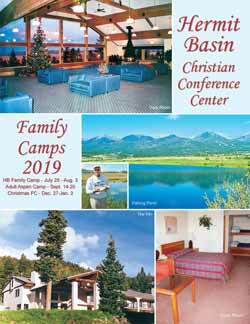 Hermit Basin is a Christian conference facility located in the Sangre de Cristo Mountains of south-central Colorado. 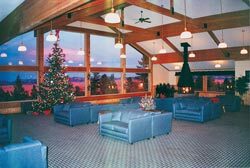 Our Day Lodge, with its kitchen and dining room that seats 120, three meeting rooms and two recreation/game rooms is ideal for use by family camps, rental groups, and retreats. The Day Lodge is spacious and comfortable with beautiful views available from the upstairs Vista room. A large outdoor sundeck for enjoyment or summer cookouts is located on the west side of the building. 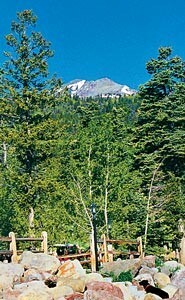 Hermit Basin’s Inn provides perfect accommodations for individuals, families, and groups. It has thirty six non-smoking rooms — sixteen with kitchenettes and twenty with bunk beds. All rooms include a queen size bed, queen size sofa sleeper, private bathroom, television, and telephone. 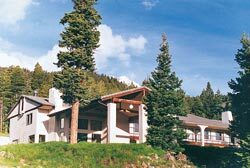 On-grounds and nearby recreational opportunities abound, including fishing, biking, hiking, swimming, golf, horseback riding, skiing, tubing, whitewater rafting, and many more. Nearby attractions, like Bishop’s Castle, the Royal Gorge, and The Great Sand Dunes National Park are available almost year-round. Find us on a map. You may discover that Hermit Basin is the perfect location for your next conference, church group retreat, family camp, or individual vacation. Contact us for more information or printed brochures.